Home Internet What is Paytm Golden Gate and How it’s work/Requirements/join? Hello Friends… In this Article we Talk about ” What is Paytm Golden Gate App and How it’s work / Requirements / How to join ? ” Paytm Golden Gate very Good Opportunity for Freelancers. You easily make money with Paytm Golden Date App. 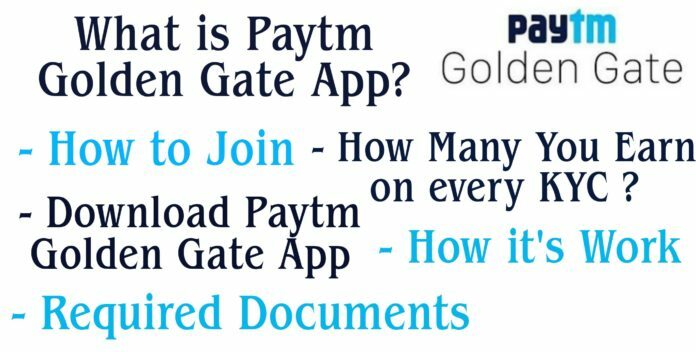 What is Paytm Golden Gate App ? Golden Gate App is a Property of Paytm. Complete your Friends, Family, Others Paytm KYC and Earn Money. This app Can used by Paytm Partners to Onboard LYC Customers on Behalf of Paytm. How much Paytm Pay you for every successful KYC ? You easily Complete KYC with Golden Gate App. This app official for KYC. Paytm pay diffDiffe Prices on KYC. How to Join Paytm Partner Policy (Golden Gate) ? Step 2. Complete Your KYC, Now Paytm send you link for Download Golden Gate App. Step 4. Now you are Ready for Complete KYC’s of others and Earn Money. Conclusion :- Now you are Ready to Register on Paytm Golden Gate App and Complete you Friends, Family, Others KYC and Earn money. Paytm India’s Number 1 Payments App. if you doubt on Golden Gate app, Don’t Doubt on this app because Paytm App 100% Trusted App. You easily earn money with Paytm Golden Gate app. If you like this Article, Please share with your friends and Read other articles like this.